Progetto per lo stand dell’azienda Macaf di Milano in occasione della fiera Host di Milano 2011. Stand realizzato dalla OGS s.r.l. 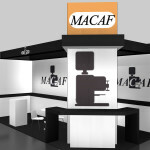 Project for the stand of company Macaf from Milan, on the occasion of the exhibition Host in Milan 2011. Stand built by OGS s.r.l.